My 2 year old was so excited to get the car seat box open. When I had taken it out and laid it on the floor ready for assembling both my girls thought it would be a good idea to climb all over it. When the seat was delivered it had the back folded backwards, my first task was to follow the instructions, as a busy Mum I like to look at what is in the box and see if I can figure how it works before reading the instructions. So when I saw the ‘body support’ I quickly wanted to know if this needed to be used with my 2 year old. I would have liked to have been able to find body support in an index so I could see at an instant if it was to be used. Instead I needed to read through the instructions and when I found the right part I discovered that the ‘body support’ wasn’t needed for a child if the shoulder straps were not on the lowest setting. How wonderful to have a car seat that can be used from the age of 9 months to 12 years. 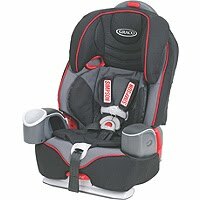 The new Graco Nautilus 3 in 1 Car Seat.